Web applications built with Datifex's DataUX Platform run entirely within the browser with no need to download software, install browser extensions, or connect to a cloud service. Developing a 3D web apps is easy. Web apps open a 3D datascape, places .obj objects in the space, connect the objects to data streams and controls, assign behaviors to the objects, and give users the power to interact with the objects. IoT, industrial controls, analytics, simulation, digital twins and other data sources and controls are generating more complex and an overwhelming rise in quantity of data. It is also becoming more and more difficult to communicate what is going on with current technologies. The DataUX Platform enables the next generation of visualization and interaction with data and external systems, extracting more from data. It also creates new opportunities to involve non-technical users, power new services, and aggregate more sources of data and control external systems. DataUX makes it easier to develop and support scalable data-driven 3D web applications. DataUX abstracts away the complexities of working with a game engine. Writing a web application based directly on a game engine requires knowledge of game development and results in a “one-off” and hard-coded implementation. DataUX uses an open source Apache 2.0 game engine, requiring no third-party licenses. It provides a concise set of APIs for creating a 3D space (with default lighting and cameras) in an HTML 5 canvas and connecting objects in that space with data streams. Interact with data-driven information through visual cues, context and interaction from within 3D geo-spatial environments. Reduce the number of systems required to access information, reducing errors and reducing the time from insight to action. Interact with data in scalable web apps based on high performance in-browser game engine technology. 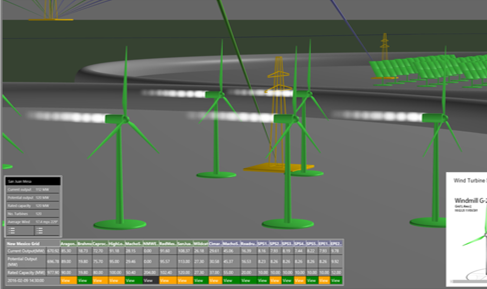 Data-driven animation and what-if interaction for simulation and digital twins. Interact with data and services from within any browser and reach a broader audience of users, collaborating through a "single pane of glass". Datifex' UX paradigm creates opportunities to power new services, monetize data, join together decentralized systems and most importantly, it is the next generation of human UI.